Here is another outstanding hike in the Indian Heaven Wilderness. The hike begins at the Cultus Creek Campground off Forest Road #24. The trail is very steep right out of the gate and continues that way for about a mile. There are some well placed switchbacks that make the elevation gain quite tolerable. Most of this part of the hike is in dense forest. At about a mile, at the corner of one of the switchbacks, you will come out onto an opening with absolutely incredible views of Mt Adams, the Goat Rocks, and Mt Rainier. Then its back into the forest for another mile. As the trail gains elevation it is more and more in the open. At about 2.25 miles you will come to the junction of Trail #33A which leads to Deep Lake. Continue on straight ahead passing Cultus Lake to your left. The trail reaches its highest point just past the lake at the junction to Trail #34. Keep straight ahead on Trail #33 as you begin to lose elevation. In about a half mile you will pass the junction to Trail #179, and then you will come to Clear Lake. After this lake you will come to the junction of the Pacific Crest Trail (PCT #2000). Bear left and follow the PCT south. Soon you will pass Deer Lake on your right. It is just a short walk to the lake, then back on the trail. 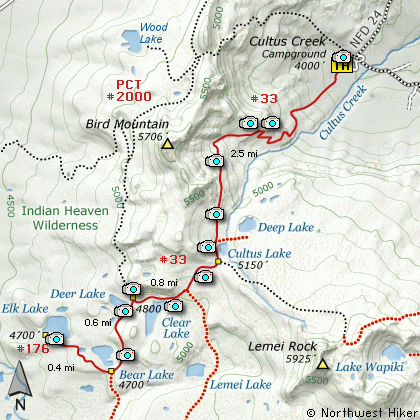 In about a half mile you will come to the junction of Trail #176 which leads to Elk Lake. Bear right and follow this trail past Bear Lake. If you have time, explore the north side of the lake before returning to the trail and heading for Elk Lake. It is only about a half mile to Elk Lake. The trail is basically level and mostly in dense forest. When you arrive at Elk Lake take time to explore the south and western shores. Return to the trail head via the same route you used to get to Elk Lake. Bear left and continue on SR141 westbound out of Trout Lake for about 5.5 miles and you will cross into the Gifford Pinchot National Forest and the road changes to Forest Road 24. Continue westward on FR24 for another 2.5 miles and you will come to the junction where FR24 turns north. Turn right and continue to follow FR24 north for another 5 miles and you will pass the trailhead for Wapiki Lake. Continue on SR24 for another 4 miles and you will come to Cultus Campground on your left. Enter the campground and look for the parking area and trailhead for this hike.